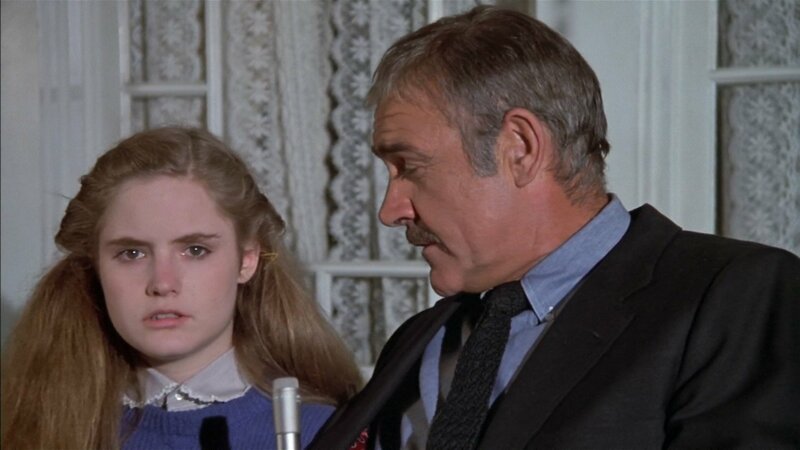 A year before returning to the role of James Bond in Never Say Never Again, Sean Connery starred as reporter Patrick Hale in the 1982 film Wrong Is Right, also known as The Man with the Deadly Lens. An excellent supporting cast that includes Robert Conrad, Leslie Nielsen, Hardy Krüger, Ron Moody and many other great actors appear in this occasionally thrilling political satire that is just as relevant in today’s world as it was in 1982. 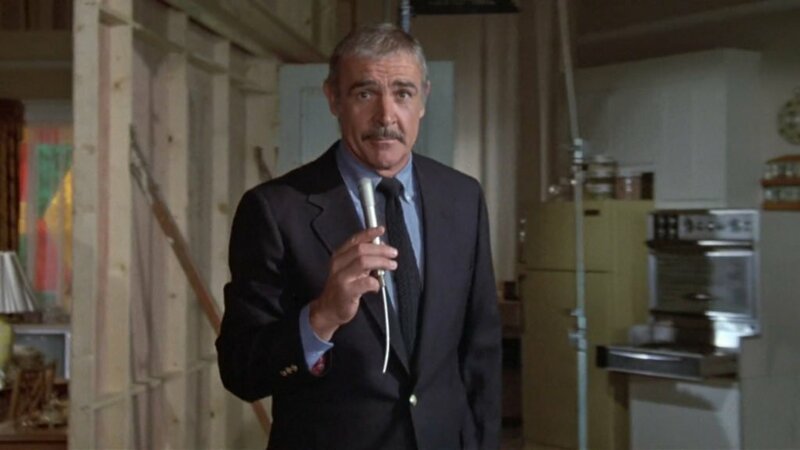 Throughout the film, Connery wears American takes on outfits that Connery wore as James Bond, including a medium grey suit with a white shirt and a dark grey tie, a charcoal suit with a white shirt and a black tie, a brown gun club check jacket with medium grey trousers and a black polo neck, and a navy blazer, which is perhaps the most Bond-like of all of Connery’s outfits in the Wrong Is Right. 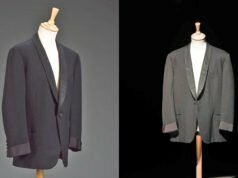 Sean Connery’s navy blazer is made in the ‘updated American’ style that dominated American ready-to-wear that remained virtually unchanged for roughly thirty years from 1980 to 2010 and is still widely available. Developed in the 1960s, the updated American style adds front darts and more shoulder padding to the boxier Ivy League style whilst removing its vestigial top third button that the lapels fold over. Connery’s blazer follows this style with a button two front in a medium button stance, straight shoulders with padding and the most subtly roped sleeve heads (natural sleeve heads are most common on updated American jackets), a lean chest, and a gently suppressed waist. The jacket has all of the classic details for an updated American-style blazer: swelled edges, flapped patch pockets on the hips, a welt breat pocket, a single vent and three buttons on each cuff. The blazer’s buttons are shiny brass. Though the blazer’s lapels are the balanced, timeless width that returned to fashion in the conservative 1980s, the blazer has a 1970s-esque fancy red paisley-patterned lining that can be seen through the cuffs. 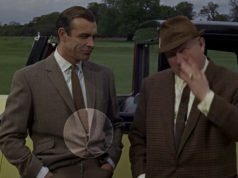 Like with his blazers in the James Bond films, Connery wears dark grey flannel trousers. The trousers follow the style of the time with a plain front and straight legs with plain hems, and they are worn with a belt. 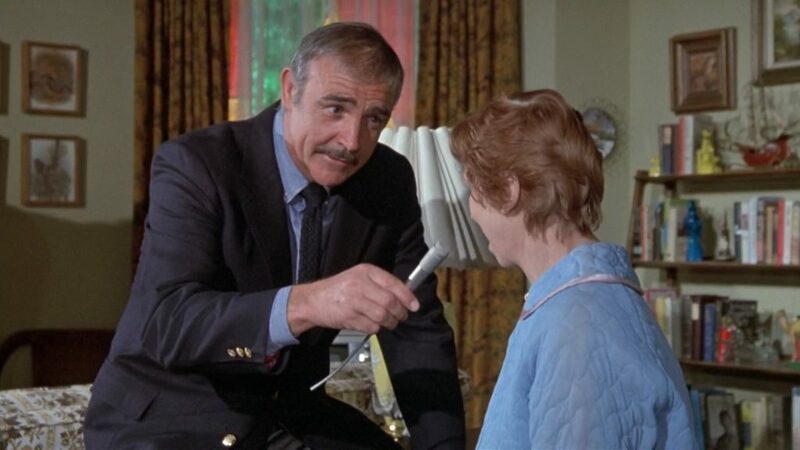 Connery’s medium blue semi-solid shirt is likely pinpoint oxford. The shirt’s button-down collar has a lot of tie space and a gentle roll. The cuffs have a single button and rounded corners. The shirt likely has a breast pocket and centre box pleat in back since these details can be found on Connery’s other shirts in the film and are the standard details on an American button-down shirt. With the blazer, Connery wears a navy crocheted silk tie with a chunkier texture than an ordinary knitted tie. It likely has straight ends. He ties it in a bulky Windsor knot, and the knot is too big for the collar even though the collar has plenty of tie space. Connery’s shoes are black lace-ups, which are probably oxfords. I’ve never seen Wrong Is Right, I must get a copy. I like the blazer, a classic style. Also Connery’s hairpiece in the film looks a lot better then the one he wore in Never Say Never Again, he suits a bit of grey. Do you think the straight padded shoulders work for Connery Matt ? 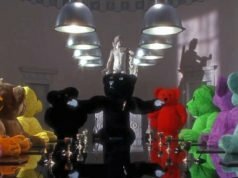 and also will we be seeing more posts from this film ? I think the shoulders are fine on him. The blazer is most likely ready-to-wear. I may write more about this film in the future. Do you think the blazer is most likely ready to wear Matt ? Not a bad outfit actually, even though the tie offers no contrast to the blazer. Do you think Connery chose dark grey trousers over medium grey trousers with his blazer because he thought they looked better on him or for the formality factor ? These trousers went better with the gun club check jacket than medium grey would, so they got something that could go well with both jackets. I like it when characters mix and match items, it’s more realistic. It’s what I do when I travel. I am getting a copy of Wrong Is Right and will give it a viewing. It’s a good look on the aging Connery. I think a normal knitted tie offers enough texture so I’m not sure I’d ever go with a crocheted item, but it hardly looks bad either. I quite like the jacket. Polo Ralph Lauren make a very similar blazer, had my eye on one for a while. I prefer double vents, but I can live with one vent. Great outfit overall. The only let down being the lousy choice of shirt. This is where Connery’s lack of innate sartorial nous shows. Another actor may have suggested a different shirt. In that case the outfit would’ve been excellent. It is common for Americans to wear a button down Oxford with a blazer. Especially in that era, you and I wouldn’t wear anything less then a proper formal shirt with a turndown collar as it should be, but Americans often wear less formal shirts with blazers for better or worse. -Might it be conceivable that Connery had no influence on the choice of shirt? There are wardrobe responsibles who do that – they don’t ask actors if they like what they are supposed to wear. And quite frankly: I cannot stand that “innate style” NONSENSE! Well Matt,the two buttons jacket with front dart and shoulder padding was a must of mid 50s..and was the favorite cut by JFK. You have read my message about Anthony Sinclair? The updated American cut started in the 1950s and became more popular in the 1960s. The typical 1950s American cut had a lot more shoulder padding and a more dramatic silhouette, still more like the old Hollywood suits. I’m not sure which message about Anthony Sinclair you are talking about. I have write to you in contact. Well,i have some scans of pictures of Anthony Sinclair’s suits of 50s. If you are interested i can send you by email. Okay. Use the contact form and then I’ll get back to you so you can email me the pictures. Matt the blazer’s length doesn’t look that long. Looks shorter then the Blazers that Roger Moore wore in the 1980’s from Hayward. You can’t compare lengths on different people. Connery’s jacket also looks shorter than it is because of the angle you see his full body. True, it is hard to tell. Roger Moore could have longer legs then Sean Connery or vice versa. it is hard to judge. Plus Connery’s blazer is most likely just off the peg and all of Moore’s blazers are bespoke. Connery’s American blazer is similar to a blazer I have but mine has patch pockets. The shoulders are similar with the straight padding with gently roped sleeveheads. I had mine altered slightly with a bit more shape through the waist. I think Connery looks better with less padding, but he has worn many jackets since Bond with padding. 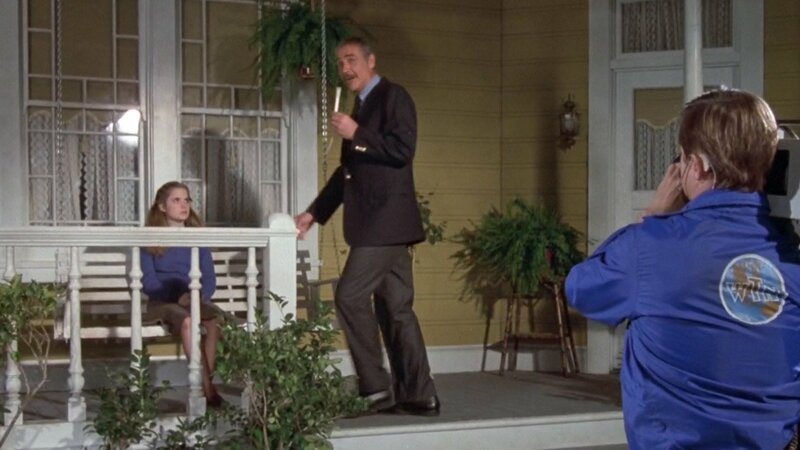 Connery wears a navy cotton jacket in the film Just Cause which was a nice warm weather alternative.